Tasmanian Aborigines did not grow up speaking our language as a first language – there is no shame in that. As a consequence of the devastating impacts of invasion and colonisation on every aspect of our lives, we have had to deliberately and arduously restore our language to its spoken life. After two decades, Aboriginal people of all ages can now speak palawa kani, the language of Tasmanian Aborigines, and children learn it from an early age. The Tasmanian Aboriginal Centre is acknowledged both within and outside the Aboriginal community as the body with responsibility for that work, conducted by the palawa kani Language Program across the state since the early 1990s. The palawa kani Program was among the first in the country in which Aboriginal people ourselves learnt the necessary linguistic methods which have since enabled us to do all the retrieval work on our language. palawa kani means ‘Tasmanian Aborigines speak’; it is the only Aboriginal language in lutruwita (Tasmania) today. There are no living speakers of the original Tasmanian languages and spoken records of the original sounds are limited to a few sounds (that can only just be heard) which were spoken by Fanny Cochrane Smith on the 1899 record on which she sang traditional songs. Between 8 and 16 separate languages could have been spoken here originally; we will never really know. Some tribes had been wiped out by contact sicknesses even before full scale invasion and the languages continued to die away with the people. Fortunately, remnants of many of those original languages were written down in wordlists by more than twenty different European recorders, starting from Cook’s visit in 1777 right through the colonial period. Most of these recorders were speakers of different regional dialects of English; another was a Scot, one a Danish, many were French. Each of them attempted to reproduce the unfamiliar sounds they heard in the Aboriginal words through the spelling system of their own languages. Different recorders wrote different spellings for the same word, and individual recorders even wrote several different spellings for the same word, indicating they heard it on different occasions and from different Aboriginal speakers. Their different records also show frequent disagreement and confusion about the meanings of the words, and about the area of origin of either the word or its Aboriginal speaker, and often both. Most tragic of all, there aren’t enough words or information recorded of any of the original languages to rebuild any one of them exactly as it was. As a result, palawa kani combines words retrieved from as many of the original languages as possible. Firstly, some people think if you select a word or words from a wordlist, which the recorders have said are from the same area, you have ‘Aboriginal words’ of a ‘local language’. But a word list, however well or poorly researched and compiled, is just that: a list of ‘words’, not a language. Furthermore, we have found through over a decade of historical and linguistic research that not all the information given by recorders about the areas or languages they said the words came from is reliable, and some is just plain wrong. Secondly, you need to look further than published books and compilations of wordlists to find evidence for languages no longer spoken. A wealth of manuscript material from the colonial period is amassed in libraries and other institutions both in Australia and overseas, and this primary source material contains the first-hand observer accounts necessary for the scholarship required to retrieve evidence of sleeping languages. These primary source records, together with a very few later audio recordings of Tasmanian Aboriginal speech, and language remembered into the twentieth century, are the sources for palawa kani. The third misunderstanding is that the spellings that appear in various lists of recordings of Aboriginal language are Aboriginal words. In fact, they are only approximations by those European scribes of many nationalities who tried to capture unfamiliar Aboriginal sounds in their own European spellings. Those spellings of words written by the recorders, and since published by Plomley, Ryan, and other historians and writers in their books, and which now appear everywhere – on websites, in museums and other interpretative displays – are not in themselves Aboriginal words. Nonetheless, the recorders’ spellings are essential. Without them we do not have any representation of how our languages sounded, and what the words meant. It is possible to use those spellings (also called ‘recordings’ and ‘spelling variants’) as a starting point for bringing back the words they represent to as close to their original sounds and correct meaning as is possible. The palawa kani Language Program team recognised however that the value of any recording is only as credible as the person who wrote it down. One of the Program’s earliest tasks was to determine the most accurate, hence most reliable, recorders of the sounds and meanings. This enabled us to identify the strengths and weaknesses of individual recorders. These factors are taken into account with every word revived. A linguistic research project undertaken by the palawa kani Language Program in the 1990s confirmed what sounds existed in the original languages, and an alphabet was custom designed to represent those sounds, in line with the decisions made by Aboriginal community members at large statewide meetings. To retrieve the authentic sounds of each individual word, those spellings from the recorders are analysed through a linguistic process called ‘reconstruction’. ‘Reconstruction’ is a linguistic term for a standard process used world-wide in the recovery of languages which are sleeping or no longer spoken; most of these are indigenous languages. Unfortunately this term is too easily misunderstood or wilfully misinterpreted. It does not mean ‘to construct’ a language, or ‘to create’ one – in the sense of just making things up from no evidence, or randomly selecting European spellings from wordlists, and claiming those words to be ‘language’. On the contrary, it is a rigorous process by which linguists and language workers recover the original sounds and meanings of the words of a language from all the recorded versions of the words. The most likely sounds of each word are determined by comparing the spellings of all the recorded versions of that word. All the possible spellings are transcribed into the International Phonetic Alphabet (IPA), which contains symbols for every possible sound in human speech. Through this analysis, we are able to determine as closely as possible the original sounds recorders tried to represent with their spellings. Those sounds are then written in the palawa kani sound and spelling system (alphabet). The word’s meaning is worked out in a similar way, by comparing the translations given for all the recorded versions of that word and cross checking these where possible with the reliability of the recorder/s, the context of when, where and from whom the recording was made, the accuracy of the language region given by the recorder/s, other historical information related to the subject of that word, and cultural knowledge still held within the Aboriginal community. For the names of places and tribes, further historical and geographical research is usually also necessary, together with knowledge still held within the Aboriginal community today. Only this thorough research ensures that words revived are, as far as possible, from the original language of the place. Taking information from wordlists at face value is how mistakes are made. An example of this is the name for the Mersey River. tulaminakali (spelt ‘tollumenergully’ by George Augustus Robinson) is the proper name. This is a word from the Port Sorell language, the northern language spoken in that area, and shared with Robinson when he travelled with two Port Sorell tribespeople in April 1832 to the Mersey River and the ochre site on the Gog Range. tulaminakali shares characteristics with the name of that important ochre site – tulampanga – and with other northern language names for places in that area. Yet another word in its English spelling – ‘paranaple’ – has been selected to name the Devonport Arts Centre; a word with no information at all about its provenance, recorded at Wybalenna by a recorder who, by his own admission, did not know the people well nor where they were from; and which, in a related form, is also recorded as a name of the Tamar River. Other instances of inappropriate namings are the ‘Aboriginal names’ which have been assigned in earlier decades to dozens of towns and municipalities throughout Tasmania. Only a few places in Tasmania still carry their original names, albeit in English spellings; for example, Triabunna, Ringarooma, Boobyalla, Tarkine. Most ‘Aboriginal names’ for places which appear on signage and maps were plucked straight from wordlists in their English spellings by settlers, surveyors, the Hydro Electric Commission naming its towns in the 1950s, and various municipal authorities. None of those names are the original names for those places, and they are not from the language of that place or area. For example, Marrawah is an eastern word for ‘one’; Poatina is a south eastern word for ‘cavern’ (cave) and Naracoopa is a north eastern word for ‘good’. All are completely outside of the language of each place. The best that can be said is that these English spellings of inappropriately applied words do provide some evidence on maps and other signage of the original Aboriginal languages. However the means by which they were imposed without consultation with Aborigines has resulted inevitably in their inauthentic forms, inconsistent sound and spelling systems, and unsuitable applications. Fourteen authentic Aboriginal names have been officially reassigned to the places to which they belong, and are now seen on some signage and maps in palawa kani spellings. Thirteen of these were gazetted by the Tasmanian State Government’s Nomenclature Board under its Aboriginal and Dual Naming Policy. The fourteenth name is Narawntapu National Park which replaced the name ‘Asbestos Range National Park’ in 2000, under the National Parks and Wildlife Act 1970. See all these names at http://tacinc.com.au/official-aboriginal-and-dual-names/. 1. The Aboriginal speaker/s who told the word to the recorder/s is named. 2. The Aboriginal speaker/s of the word comes from the place itself, or nearby. 3. The word is recorded from the language of the place or people of that place even if the speaker of the word is not named. 4. Context of the recording of the word and/or any other historical context exists. For place names, two other criteria which apply to the retrieval of ordinary vocabulary are less relevant: that there be a number of spelling variants and that these are preferably from more than one reliable recorder. While it is always ideal to have several spelling variants to better enable recovery of the original sounds, in many cases there exists only very few and sometimes only one recording of a name for a place from the language of that area. As for recorders, there are only two recorders of Tasmanian place names, with occasional records of a very few place names from a handful of their contemporaries (Jorgenson, McGeary; ‘HWM’). Most of the Aboriginal names for places within Tasmania were recorded by George Augustus Robinson. He was one of the first Europeans to travel widely in Tasmania Between 1829 and 1834 Robinson was engaged by the colonial government to directly contact all Aborigines in Tasmania and persuade them to relocate to offshore islands. During those years he recorded (wrote down) a lot of cultural information both from the Aborigines who travelled with him as guides and also from Aborigines he met who were still on their own country. From 1835 till 1839 he was commandant of Wybalenna on Flinders Island, where he continued to record small amounts of language from the Aborigines interned there. In his journals and other notebooks devoted specifically to lists of words, Robinson compiled the most extensive of the records made of the Aboriginal languages while they were still fluently spoken. His is the only compilation which covers a wide range of tribes and regions. He wrote down over 500 recordings of words for places, although many of them are simply different spellings of the one word. A few other recordings made before 1831 came from Robinson’s clerk, Sterling, but these seem mostly to be simply slightly different copies of Robinson’s own recordings. 67 other names for places were recorded by Joseph Milligan between 10 to 15 years later, between 1844 and 1847 when he was surgeon-superintendent at Wybalenna. By this time the surviving people from different tribes had been living together for over 10 years and a mixed language was being used, with basic words mainly from north eastern languages. Very few, if any, of the words for places were told to Milligan in the actual place. Also, he did not know all the people very well; he does not name the person who told him words but only occasionally the tribes he thought they were from. Like Robinson, he recorded other language words as well, and many of his translations are very suspect (as NJB Plomley also noted when he compiled his Wordlist of the Tasmanian Aboriginal Languages 1976). So Milligan is a less reliable recorder than Robinson. He is however good at recording sounds, and is the only recorder who told us what sounds his spellings represent. So the preferred choice for a name is a word recorded by Robinson. It is very useful to have spellings for a word from both Robinson and Milligan, to get a better idea of the sounds. eg. the only recording of a name for the Jordan River is kutalayna, from Milligan. To have the best chance of working out the original sounds of a word, it’s best to have a number of spelling variants from the same language region and preferably from a number of different and reliable recorders. With place names there are only the two recorders; but often Robinson has has made several recordings of one word on different occasions – eg. he recorded 15 spelling variants of takayna. Sometimes there is only one recording (spelling variant) for a word and so that has to do. For instance, larapuna has only the one recording, from Robinson. Where words are said by their recorders to refer to more than one place, it is preferred to revive the word for which only one translation was given. This also then allows the other word/s to be used to name the other place/s. This is the case with lutruwita and truwana (see p17). Geographic features in the Tasmanian landscape, on both land and sea, had Aboriginal names until they were supplanted by Europeans in the 19th century. The names formed complex interlinked networks in which places, their names and attributes, reflected the relationship between the people and the land. The names were not arbitrary but integral to the places to which they were attached, and derived from the activities of ancestral beings who formed the landscape as they moved through it. While European names mark individual places and individual memories of parcels of history and generally have no particular connection to each other, each standing in its own right, the meaning of many Aboriginal names can only be understood through their connection to other names and places. They also describe the land physically and identify its resources. Therefore many words translated by recorders as the “name” for a specific place are also the same words as those for geographical features or their characteristics, or can include parts of those other words. The daily use of the names meant history was always present, always available. But this use stopped with the destruction of our ancestors’ society, and the decimation of our culture and language, and most of that knowledge behind the names of places has tragically been lost. While we are able to retrieve the sounds of the names and re-establish their connection to the places they refer to, we cannot today decipher the original ‘meaning’ of many of our words for places. Nonetheless, like all words, our place names continue to evolve and accrue further layers of meaning and association which embody that history of near loss, eventual retrieval, and their current and future use by modern Aborigines. Robinson made 1 recording of this name, and another recording for the last part of the name. No Aboriginal speaker is named for either recording. Robinson did not translate this word as ‘Sundown Point’. That name may not have been in use at that time. Robinson’s description and his sketch map of the place do match with what is now called Sundown Point. The sketch map (shown below) appears alongside these words: ‘lar.rer.tore.rone – the long point past Arthur R’. His rough sketch shows three points of land, named (reading left to right) as: ‘Sandy Cape’, ‘Lar rer tor rone’ and ‘Arthur R’. ‘Lar rer tor rone’ is in the right location for Sundown Point. ‘roe.noun – the point where Jack made the smoke south of Arthur River when the natives came to the river’. when he met a large group of Port Davey, Pieman River and Sandy Cape Aborigines at the Arthur River. Plomley [1991:20] also identifies Sundown Point as the place Robinson referred to with the name ‘lar.rer.tore.rone’. No other word is recorded for this location. Of five words recorded by Robinson for ‘West Point’, nungu is the only one he identified as referring to West Point only. * ‘mow.wer.rine.doon.dur.rick’ – his recording is unclear as to the exact location. Robinson wrote 5 spellings of nungu on different occasions between February and July 1832, mostly in June on his expedition to the north western tribes; and a sixth spelling on a later occasion in 1834. These different spellings allow us to confidently reconstruct the sounds of the word. He wrote one of these recordings – ‘Nongor’ – on the third point south of Mt Cameron, on his sketch map accompanying his journal entry for 18 June 1832. This is the right location for West Point. Panapuk, an Aboriginal speaker from the area told Robinson the word. This similarity of the names for both a place and also the tribe or band occupying that place frequently occurs; other examples are yingina and takayna. There are more spelling variants of pinmatik than any other words recorded for ‘Rocky Cape’. The word has the ‘ik’ ending which is a characteristic of north western and western languages; it is a word from the language of the region in which Rocky Cape is located. Robinson made 5 recordings of pinmatik. 3 he translated as ‘Rocky Point’, and 2 as ‘point of land’. These different spellings allow us to confidently reconstruct the sounds of the word. His journal entries for 24 and 25 July 1830 describes his party travelling from the East Inlet and Black River (on Sawyer Bay, east of Stanley) to what he calls ‘Rocky Cape’. On 26 July he records pinmatik for what he calls ‘Rocky Point’ once, but then later in the same entry calls ‘Rocky Cape’. His description of the area, including the Cave Boat Harbour, matches Rocky Cape. Robinson heard the word spoken by Aborigines from the ‘Robbins Island tribe’ in the north west and the ‘Ninene tribe at Port Davey’ the south west. They told it to him at his camp at Sister’s Creek, a few miles south of Rocky Cape itself. * koy.bun.dy – two spellings, one perhaps from Trukanini from Bruny in the south east. * ‘tang.dim.mer’ – also recorded to mean Albatross Island, Circular Head and West Point. This recording has only one spelling and no Aboriginal speaker is named. The name ‘Tangdimmer’ was used at the time of the reoccupation of Rocky Cape by the Aboriginal community in 1991; this was before the Language Program began its research to determine the most appropriate names for places. Another name claiming to be Tasmanian Aboriginal language is on display in installations at Rocky Cape – ‘Tangdimmaa’. 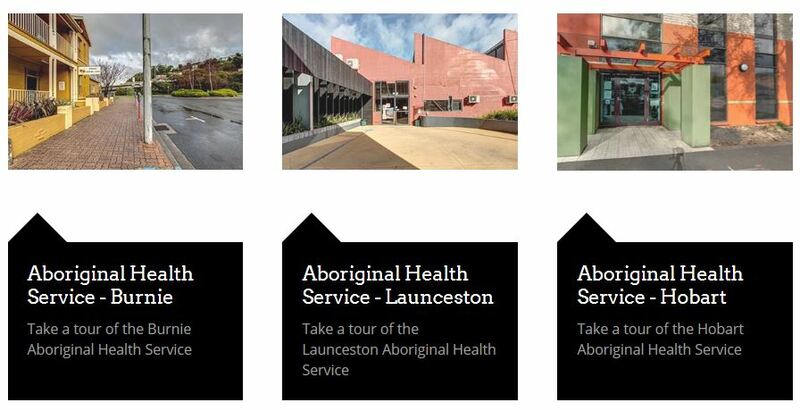 None of the language on these installations is authentic, and these panels were installed without consultation with the Tasmanian Aboriginal Centre, the only organisation dealing with Aboriginal language matters. which directs walkers to ‘pinmatik (Rocky Cape) Lookout’. This signage followed appropriate consultation between the NW branch of Parks and Wildlife Service and TAC in 2011. Triabunna is one of only a few places in Tasmania which still bears its original name, although in an anglicised form. The Aboriginal word trayapana originally applied to the country around Triabunna and Spring Bay, not solely to the location of the town later built in the area. Robinson recorded the word when he visited the area in 1831 with Aborigines from nearby areas, who told him it referred to country around Triabunna and Spring Bay. He was travelling with a group of Aborigines which included Waypamunina, also known as Tikati. Robinson had recruited her to guide him as he walked down the east coast from St Helen’s Point to Hobart, because she was from the country around Waterloo Point/Little Swanport (adjacent to trayapana) She was sister to Tanalipunya (the wife of Manalakina). Also present was Kikatapula, also from Little Swanport. (Robinson journal 1.12.1830; 17.12.1830). Both Waypamunina and Kikatapula were from bands of the Oyster Bay tribe. trayapana is in the country of the Oyster Bay people. In two other places in his notebooks for 1831, Robinson described ‘Troibunner’/’Triubunner’ as ‘the country at Spring Bay & where Captain McLean’s farm is’. This is the only word recorded for Triabunna and its surrounds. No indication is given of its meaning. ‘Native hen’ The word Triabunna is not the same as the word said to mean mean ‘native hen’. That word is ‘tiabunna’, recorded with one spelling by Joseph Milligan sometime between 1844 and 1847. This recording is missing the ‘ R’ sound seen in the recordings of Triabunna; trayapana. Such an omission is unusual for Milligan, usually quite good at recording sounds. The single spelling of ‘tiabunna’ is not backed up by any of the five words recorded for native hen, either by Milligan or any other recorder. * says “tiabunna” is from Bruny language, which is not the language of this area – Triabunna sits within the country of the Oyster Bay people. * has spellings of another word he translates also as ‘native hen’. That same word has been recorded by more reliable recorders as Cape Barren Goose, and is known as such by today’s Aborigines. * does not list the word ‘tiabunna’ as the name of the place in his list of place names published in 1859. See notes on the limitations of Milligan as recorder, p2 of this document. The palawa kani word for native hen is piyura, from the Swanport/Oyster Bay language region. Robinson recorded two words for ‘Green Point’. Of these, taypalaka has named speakers, from the area, and more spelling variations. The different spellings allow us to confidently reconstruct the sounds of the word. Robinson wrote seven spellings of taypalaka on different occasions; once in July 1830; on five occasions in June and July 1832 on his expedition to the north western tribes, and on one later occasion in April 1834. At first Robinson mistakenly recorded taypalaka for ‘West Point’, but corrected himself in July 1832 and from then translates it as ‘Green Point’. He had written one of these recordings – ‘Ty.ber.luck.er’ – on the first point south of Mt Cameron, on his sketch map accompanying his journal entry for 18 June 1832. This is the right location for Green Point. The word was told to Robinson by Narruker, a woman from taypalaka, and Panapuk from nungu. * tore.rer.pin.druck – one spelling and no speakers named. It is the only word recorded for Trefoil Island, with three spellings recorded by Robinson on five different occasions. He notes on two of these that the word came from the Robbins Island tribe and was used by the Cape Grim people, in whose territory the island sits. While travelling in the north east in November 1830, Robinson was told by one of his Aboriginal companions (unnamed) that wukalina was one of two names Aborigines used for ‘Peak hill or Mount Deception’. Mt Deception is now known as Mt William; it is a peaked or breast-shaped hill at Cape Portland in the territory of the north east people. Robinson and two other recorders recorded two other spelling variants of wukalina, and translated them as both ‘hill’ and ‘breast’. Malapuwinarana (Maul.boy.heen.ner/Timmy), a youth from Georges Rocks on the north east coast, told Robinson one of these. It is a characteristic of Aboriginal languages to use words for parts of the body for geographical features, and this seems to be the case with this word. We use this word for both the hill – Mt. William, and for ‘breast’, as our ancestors did. The other name Robinson was told for Mt William – ‘lue.ber.rer.nen.ner’ – is a spelling variant of a word for ‘the country at Cape Portland’; Mt William is within the country at Cape Portland. Makaminirina, (also called Makami), from one of the tribes originally in the Great Lake area told Robinson this word in August 1837. His tribe had been displaced soon after European settlement, and the survivors joined with other bands of the Big River tribe. It is the only word recorded for the Great Lake. ‘No.her.er.o.yer.ner – Big River tribe inhabiting the lakes’. This similarity of the names for both a place and also the tribe or band occupying that place frequently occurs; other examples are nungu and takayna. * and a later one from Milligan (1844 – 1847). All four are translated as ‘Mt Wellington’ and Robinson notes it is a word from Bruny/southern tribes. There is only one other word recorded for Mt Wellington – ‘pooranettere’. It is from Milligan, with only one spelling, and no information given; and was recorded 10 – 15 years later than Robinson’s and Sterling’s recordings. One word recorded by Robinson to mean the ‘Bay of Fires’ is the only name we have for this place. Two Aboriginal women told him the word – Rramanaluna from the country at Cape Portland in the north east, and Tanalipunya the country at Little Swanport in the east. larapuna an also include Eddystone Point, at the northern tip of the Bay. his ship many fires along the shore. There are two spellings of this word, both recorded by Robinson and both translated as ‘Oyster Cove’. All Robinson’s recordings of Tasmanian language were made before 1839; he then left Tasmania for Port Phillip (Victoria) and was not present at the Oyster Cove Aboriginal Settlement which was set up in 1847. So putalina does not refer to the Oyster Cove Settlement but to the cove itself. It is similar to another word recorded by Robinson to mean ‘mutton-fish’ (abalone). It is the only word recorded for Oyster Cove. Robinson wrote two slightly different spellings of this word, and translated both as ‘the Launceston River’. One was told him by Tanaminawayt (say: Tah nah mee nah wait) (also called Peevay (Piway)/Pairhelehoiner/Cape Grim Jack). Tunaminawayt was from Cape Grim/Robbins Island in the nearby north west. Between 1830 and 1835 he travelled with Robinson as a guide on his journeys throughout Tasmania, and told him many language words, including many place names. Parts of this word also appear in another word told by Tunaminawayt to Robinson – for ‘George Town’, through which the river flows to the sea. Two other words were recorded to mean the River Tamar. ‘Port Sorell’. Since it is better to to revive a word which has no confusion about its meaning, this word is not revived for the River Tamar. The second alternative word was recorded some 10-15 years later by Milligan, with no information given – ‘ponrabbel’. Robinson recorded this word fifteen times on his expeditions to the west and northwest in 1832 and 1834. Kit (Nollahallaker) from Cape Grim/ Mt Cameron West and Penderoin from Robbins Island each told him the word on different occasions. takayna is recorded as the name of the people from the Sandy Cape-Pieman River area. It is an acceptable practice to use the same word for a place as for the people of that place. Other words for a place are the same as the word for ‘the nation at that place’; some examples are nungu and yingina. So we revive takayna for the Tarkine area, and also for the people of that area. There are no other names recorded for this place or its people. 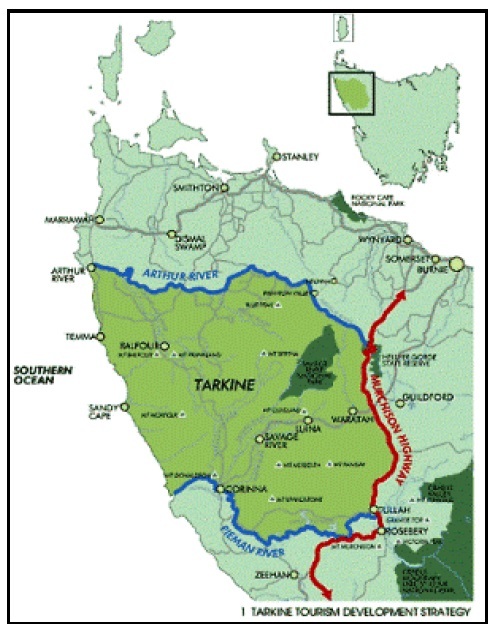 The English spelling ‘Tarkine’ has been used since the 1980s as the place name for an area of more than 447,000 hectares between the Arthur and Pieman Rivers. Conservationists chose that word with Aboriginal approval to name the area, based on one spelling variant of the name of the Aboriginal people from the Sandy Cape/Pieman River area – ‘Tarkiner’. Two words are recorded for ‘VDL’ (Van Diemen’s Land), both by Robinson. One of these, lutruwita is recorded solely as ‘name of great island of VDLand’. Robinson spelt it as ‘Loe.trou.witter’. The other word – truwana – is recorded as ‘the great island of VDLand’ and also as ‘Cape Barren Island’. lutruwita is a Bruny/southern language word. * and the second time as ‘Brune or S name for great Island of VDL’. Robinson set up his first settlement for Aborigines on Bruny Island in 1829, for about nine months, and travelled between there and mainland Tasmania – ‘the great island’ – with Aborigines several times during that time. The name ‘Tasmania’ officially replaced the earlier ‘Van Diemen’s Land’ in 1853. Aboriginal speaker Tanalipunya (Tanleboneyer) told this word to Robinson twice, to mean ‘Cape Barren’. Robinson spelt it as ‘Trow.wer.nar’. 1. No other words are recorded for Cape Barren Island. 2. Another word – lutruwita – is recorded solely for ‘Van Diemen’s land’ (Tasmania). This is then the best word to revive for ‘Tasmania’, since there is no confusion with lutruwita having been said to mean more than one place. Tanaliunya had been abducted by sealers from Little Swanport with her two sisters. Her captor prostituted her to other sealers for a fee of one kangaroo skin for a night. She was later taken by Robinson as one of his guides and travelled with him among the islands including Cape Barren from early October 1830. During this time she became wife to Manalakina, a chief of the north eastern people. Tanalipunya died in 1835. Jackson Cotton’s Touch the Morning, Tasmanian Native Legends (1979) is a collection of short stories containing language words. The material is said to derive from Cotton family papers dating from the 1830s. Separate records show that George Augustus Robinson and a group of Aborigines including Trukanini and Wurati spent a night at the Cotton farm ‘Kelvedon’ at Swansea in January 1831 [GAR journal 11 January 1831]. Manalakina (Manalargena), Trukanini (Truganini) and Wurati (Woreddy) are named as tellers of the some of the Cotton stories (although Manalakina was not present at the overnight visit at the Cotton farm). Other Aborigines who had been living in that eastern region, of whom there are differing but corresponding accounts in other records of the time, are also named as tellers of some of the stories. The authenticity of Jackson Cotton material has yet to be proved. Most of the stories themselves are just like the type of European fairy tales popular in the nineteenth century, featuring little folk, bush elves, medicine men, dreaming clouds, rain children and talking birds and animals. Stories of the births of Moinee, Dromerdene, the first animals and man, and the stars (all these feature in the Cotton tales) were publically available from 1966 in the publication of George Augustus Robinson’s journals (NJB Plomley(ed: Friendly Mission); and Robinson’s manuscripts had been in the Mitchell Library, NSW, since 1948. Most language words in the Cotton stories are exactly the same or very similar to words found in earlier recorders’ wordlists, both published and unpublished, all of which were available by the time of the publication of Touch the Morning in 1979. Therefore language words from the Cotton stories are only used in reconstructions when they are not the same as any other recordings of the word. To date, we have not found any words in Cotton which had not previously appeared in earlier records of our languages. This word published by Cotton IS the same as earlier recordings and so is NOT used in reconstruction. 2. truwana is a north-eastern/eastern word. It is therefore very unlikely it would have been used by Wurati, from Bruny Island in the south, to refer to the larger island (now known as Tasmania) which the Bruny people called lutruwita. Wurati accompanied Robinson more or less continually from 1829, and told him many Bruny language words.